Today it was 135 degrees in New York City with 111 percent humidity. Since Mother Nature decided to store up all of the heat this summer and use it up in a four day span I decided to add as little auxiliary heat as possible in creating tonight's dinner. And, no, I did not make any raw foods. 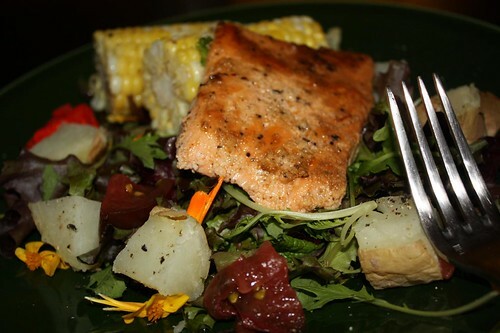 We had some kale (not pictured) on its last legs so I cooked that in a little olive oil and white wine then added some marinated salmon to the pan. I also employed Jen's corn on the cob cooking technique (which she taught me last night): wrap husked corn in wax paper, microwave for two minutes. I then made a baked potato (also in the microwave) and sliced up the remainder of an heirloom tomato. I served all of this on top of a floral salad mix which will undoubtedly earn me a fair amount of scorn from my father-in-law, though not as much as if I had served it with a form of red meat. 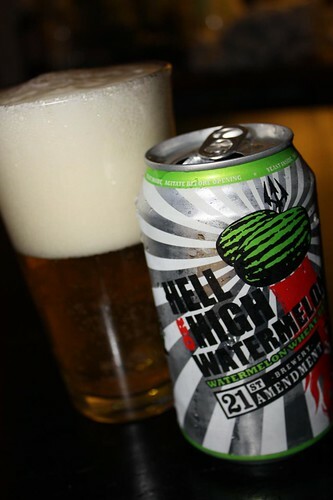 For a summer beer we had the 21st Amendment Brewery Hell or Highwatermelon Wheat Beer. This beer was described to me as "surprisingly good" and I think it lived up to that description. While I'm generally not a huge fan of flavored beers this was delightfully refreshing for a hot summer evening. Watermelon beer? It's almost as if tonight's dinner was designed to drive Jen's father crazy. I can almost hear his cries of outrage all the way from New York City. For dessert I made a crust with crushed graham crackers and Lyle's Golden Syrup. 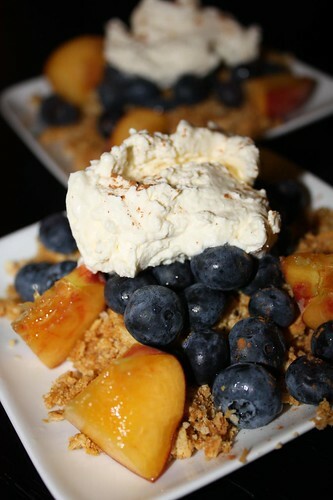 Then I served fresh blueberries, peaches, and whipped cream on top with just a slight shake of cinnamon. The only thing that could have made Jen's father more angry would have been if tonight's dinner was served warm. If I'd done that he may have boarded a plane to New York to personally give me a piece of his mind. Jen's father says that the dessert sounded quite yummy. After spending the week with my brother in Provence, I have a renewed appreciation for what my father called "didoes". Which is what floral salads and watermelon beer are. A renewed appreciation as in you now see the wonder of didos, or a renewed interested in branding such wonders as didos?